In a recent column, I discussed the morning line and examined its usefulness as a means of finding overlays. Regarding the latter, it proved about as helpful as a kick in the groin; however, I felt like I had merely scratched the surface in unearthing exactly what the morning line can do. 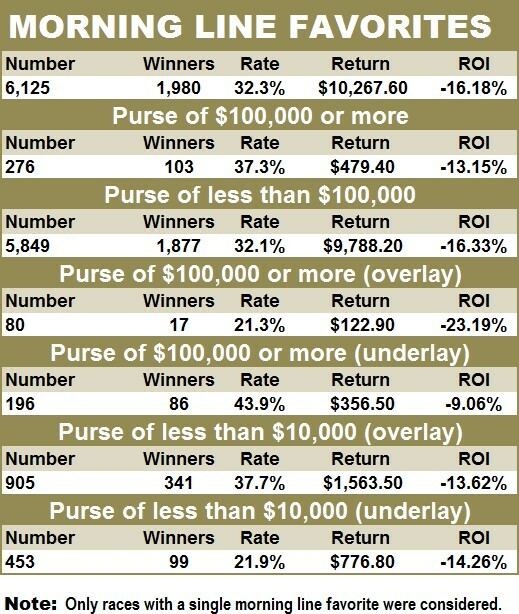 I got an e-mail from a guy recently asking me how I go about handicapping using online past performances. He explained that he hated to print out all the PPs, yet he wasn’t comfortable analyzing races on a computer screen. It’s a great question… and a common lament, I think. Generally, I print out either my Pace Profile Report or my Win Factor Report and record all my comments on them, as opposed to wasting both paper and ink printing out pages and pages of past performances. And it got me to thinking: maybe I could come up with something more generic than my reports that would work just as well. I could and I did. 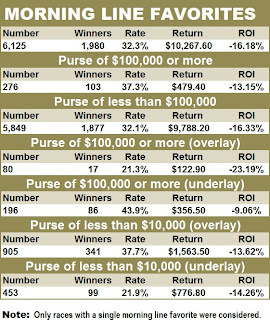 What’s more, I even came up with a rating system that, in certain instances, will allow handicappers to start with a positive ROI or at least minimize the track takeout. * Consider a horse’s most recent race and award points equal to its finishing position in that affair (“1” for a win, “2” for a second, “3” for a third and “4” for all out-of-the-money efforts). * Divide the number of days since the horse’s last race by 10 and add to the above (all races over 40 days old are worth four points). * Rank each horse’s last-race speed rating (using whatever figures you’re most comfortable with) and add it to the total. If the speed rating is not ranked among the top three, it’s worth four points. * Using stats from this year and last year, divide each horse’s total earnings by its total starts and rank the quotients from highest to lowest. Horses ranked fourth or worse are awarded four points. * Using two-year data once again, rank each horse by its win percentage. As usual, horses ranked worse than third are given four points. Note: In the event of ties, average the ranking, i.e. a tie for first and second counts as 1.5. 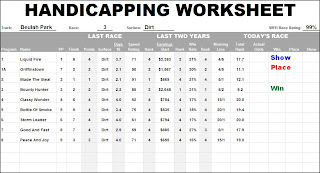 Play – Bet the horse with the lowest cumulative ranking provided it last raced over today’s general surface (dirt/AWS or turf) and the Win Factor Report race rating is 75% or higher (players can also use their own race ratings or “gut feeling” to verify the strength of the final rankings). 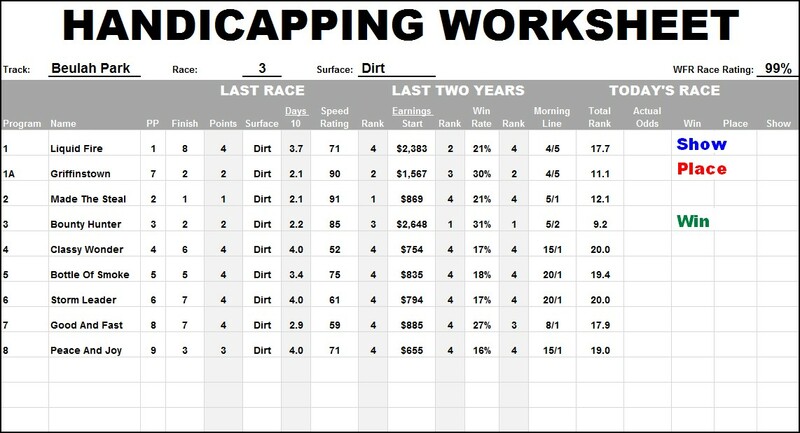 To download a blank copy of the Handicapping Worksheet, click HERE. Have a great wagering weekend! I see and I figure the diversion ought to be extremely stunning. Playing amusement is my most loved movement that I do in my extra time with loaded with happiness and get superior papers discounts from us. When we play diversion we feel free from all the strain, nothing we recollect simply center around the amusement.